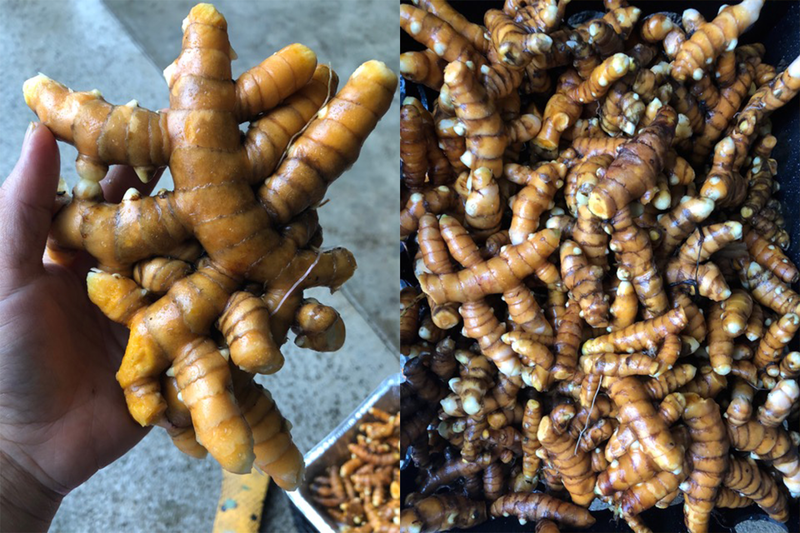 Whether you’re a permanently yellow-stained veteran or an ʻolena (turmeric) newby, now is the time to snag some healthy rhizomes from your local market or farmer friends. Depending how many makua (mother plants) were planted the previous year, harvests could be anywhere from a few, three-pound clusters to hundreds of pounds of unearthed gold. A member of the zingiberaceae, or ginger family, ʻolena is a perennial closely related to galangal, cardamom, and ginger. Though it can more or less live indefinitely if left undisturbed, ʻolena dies back annually which tells farmers it’s time to start harvesting. This is done by removing either the entire rhizome from the ground, or breaking off a clump of the plants’ densely interwoven fingers, leaving behind rootstalk for the next year. ʻOlena should be thoroughly washed and is often home to more than a few surprise earthworms. That’s because wherever ʻolena lives, a rich community of mycorrhiza and other beneficial bacterial tend to live too. Once harvested, ‘olena can be used fresh, stored at room temperature with good air circulation, or dried using a boiling, dehydrating or baking method combined with grinding or blending. Dating back nearly 4000 years, turmeric has traveled around the world and plays a strong role in many culinary traditions. A Polynesian introduced canoe plant of Hawaiʻi, the juice of ʻolena could be used for its antibacterial properties to treat ear infections or to help purify its drinkers. Some current studies suggest that ‘olena can help to reduce blood sugar but more research is needed. If you are lucky enough to come by a handful or two of ‘olena, save the makua, the central, oval shaped rhizome, or even a finger with a few growth nodes and add it to your garden. ‘Olena prefers well-draining soil with partial sun and a lot of rich organic matter. It will also grow in a 5 gallon pot with sufficient water and soil nutrients. After a few months of hibernation, the ‘olena will begin to emerge into a lush, verdant stalk and by this time next year, you too can taste and spread this amazing plant. In a heavy saucepan, bring ginger, ‘olena, and milk to a low simmer. For a more medicinal brew, add more turmeric; for spice, add more ginger. Whisk, adding cinnamon, black pepper, and maple syrup or honey to taste. Strain and enjoy hot or cold!